Kathryn Cruz is working in a team comprised of Pain Studies Lab and University of British Columbia researchers to supplement research in virtual reality for chronic pain patients. The research poster, titled “Exploring Virtual Reality Preferences in Chronic Pain Patients: Game Controllers, Genres, and VR Experiences” was well-received at the competition. Cruz received special thanks as the first representative of the School of Interactive Arts and Technology (SIAT) that submitted to SFU’s Student Undergraduate Research Journal. This SFU SURJ event aims to promote undergraduate research by providing young scientists exposure and recognition for their work by undergoing a peer-review process. Organizers hope to foster a community of undergraduates who value research while engaging all students in science communication and education. 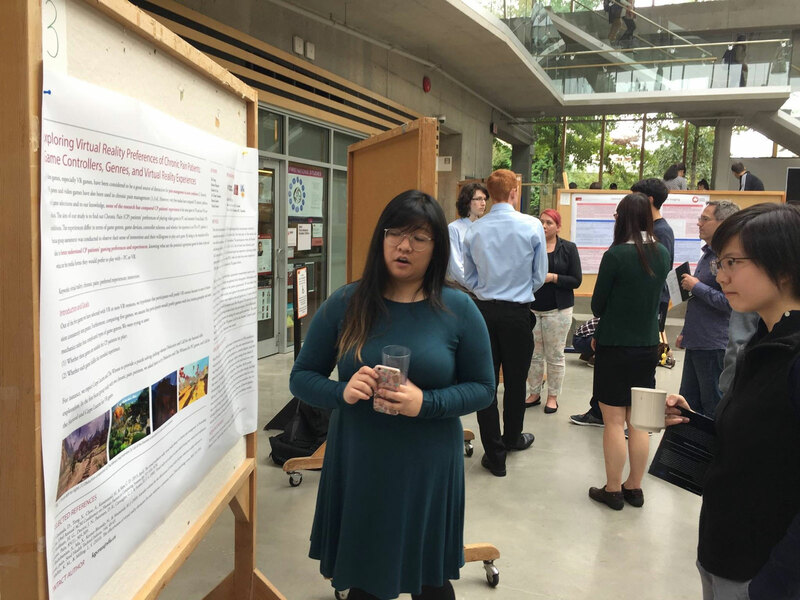 Photograph: Kathryn Cruz at the 1ST Annual Simon Fraser University Student Undergraduate Research Journal Poster Competition on September 24, 2017. 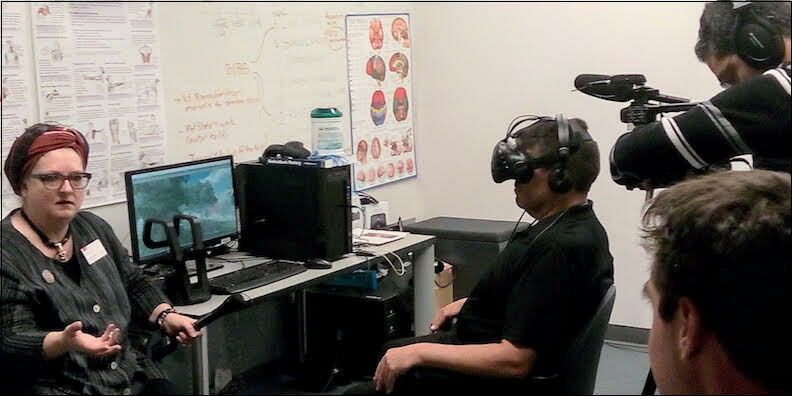 Academica.ca visited SFU’s Pain Studies Lab on September 26th to interview VR pioneer Dr. Diane Gromala. She discussed the VR systems that she has been designing, building, testing and deploying at pain clinics and hospitals since the 1990s, primarily for people who live with long-term chronic pain. Dr. Gromala also shared the scientific data that validates that her VR system is an effective form of non-pharmacological pain control, as well as future work aimed at aging populations, adults and teens who are undergoing chemotherapy and for adults who are recovering from addiction. Serkan Pekcetin ran the VR demonstration while Academica.ca’s camera rolled.